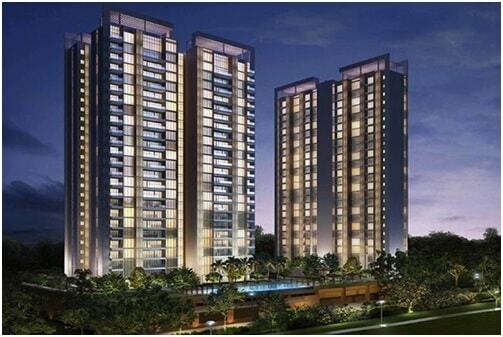 Omkar Passcode Residences are situated at Andheri East in Mumbai. It is an initiative by the Omkar Group, this project offers 1 BHK, 2BHK and 3 BHK homes, containing 6-7 towers. Passcode project stands on 74 acres of land. The carpet area of the apartments at Passcode ranges from 355 sq. Ft to 710 sq. Ft. Each tower comprises of 22 floors while there are several amenities on offer for residents. Omkar Passcode Andheri Project has been designed beautifully and will give the pleseant living such a way that end user can avail all the modern amenities at affordable Price.These heartwarming and pleasing homes are available at prices starting at just 87 Lakhs - 1.61 Crs. Omkar Passcode is project of Omkar builders which is situated at very prime location and offering 1,2& 3 bhk flats in an affordable range. Omkar Passcode in Andheri East on the land parcel to over 500 residents. A unique and attractive infrastructure is used to construct this property and best construction materials are used in this project and it is decorated with latest modern amenities and facilities. Passcode Residences are situated in such a manner that provides the benefit of connectivity from the Western Expressway as well as the surrounding areas.This new launch project would let the home buyers make a good and sensible decision to buy property with the best new launch projects in AndheriMumbai. It is certainly drawing motivation from its excellence in multi-terraced gardens. The project is strategically located in proximity to Western Expressway Highway metro station, Goregaon bus depot, Jogeshwari railway station and Andheri metro station.This region is the hub of many IT organizations, businesses, and commercial belts where we can find every kind of residential facilities in this region. This residential project is explicitly located near Andheri Highway,Jogeshwari East, Mumbai. Schools/Colleges: - Swami Vivekanand School, ShramikVidyalaya, Alfalah Primary & High School. Shopping Malls: -Infiniti Mall, Citi Mall, The Hub, Heera Panna Mall. Parks :-Dyna Play Ground, Chhatrapati Shivali Udyan Park. Hospitals: -Hajari Hospital, Sunita Hospital, Sharada Nursing Home, Savant Hospital. Movie Theatres: - Cinemax, Pinky Cinema, Navrang Cinema, Inox Leisure Ltd, 24 Karat Multiplex Cinema. Restaurants: - SK Fast Food Corner, De’ Pizza Mania, Hotel Sarvoday, Viaan Hotel. Pharmacies: - Heera Medical & general store, Dental Medical Store, Lucky Medical & General Store, Ambika Medical Stores. Railway Stations: - Andheri Railway Station, Jogeshwari Railway Station, Andheri Metro Station, Azad Nagar Metro Station. Bank/ATMs: - State bank of India ATM, S.D.C ATM, Bank of India, Union Bank of India.